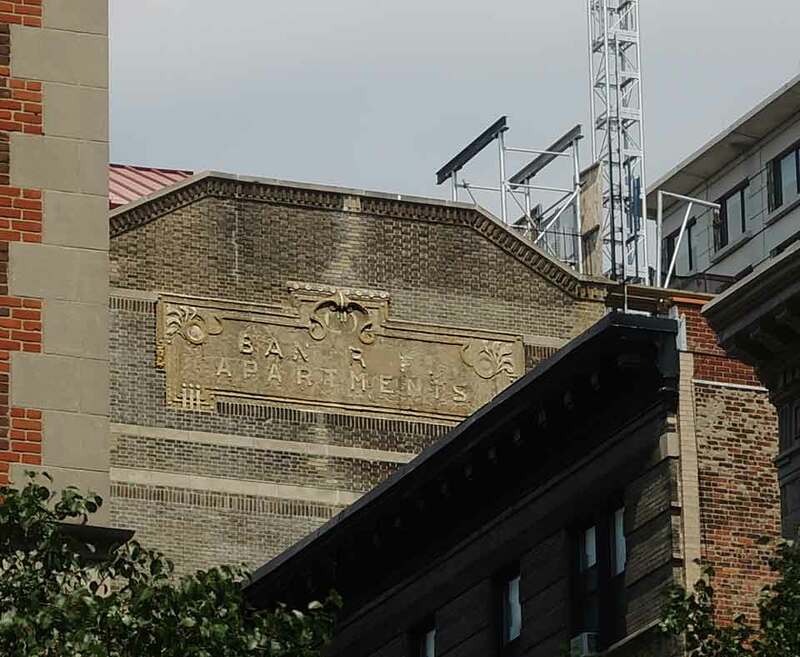 An elaborate inscription on the east wall of 509 W. 121st St. identifies this building as the Bancroft Apartments. There is also a plaque on the front entrance gate reading Bancroft Apartments. The Building Permits Database at the Office for Metropolitan History provides the following information on 509 West 121st Street, "NB 472-10; cost $350,000; 8-story brick and stone tenement; owner: Sethlow Realty Co., 149 Broadway; architect: Emery Roth, 20 E. 42 St."
Columbia University and Morningside Heights by Michael V. Susi, 2007, shows an undated postcard view of the Bancroft Apartments. This shows that there was an identical inscription on the west wall of the building. Susi's caption reads, "Teachers College acquired the Bancroft Apartments at 509 West 121st Street in 1919 to house its rapidly growing number of faculty and students, many with families. Designed by the prestigious architect Emery Roth and built in 1910, the building was originally advertised as the Sethlow Kitchenette or Sethlow Bachelor Apartments, to the consternation of Seth Low. Fearing legal proceedings, developers renamed the building. Fortuitously, leases for tenants living in the building at the time of purchase expired in September 1919 and Teachers College obtained the building empty, thus housing almost 400 students." A photograph of the new Sethlow Apartment House appeared in the New York Times, Sunday, 25 June 1911. The building is described as follows, "A number of novel features are to be found in the new Sethlow kitchenette apartment building recently completed at 509 West 121st Street. It is said to be the largest building ever erected, devoted to small apartments, containing more than 100 suites of two or three rooms, bath and kitchenette. There is ample equipment in each apartment to prepare meals, but if preferred they may be had from the restaurant on the ground floor, which is connected by dumb-waiter with each suite. The façade is unusually attractive and distinctive, being constructed of light colored brick, decorated with colored tiles. 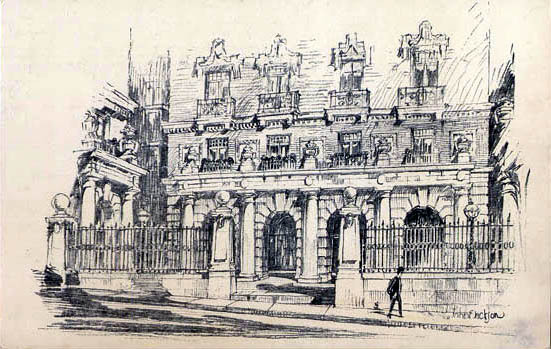 A number of apartments have been leased to members of the faculty of Columbia University, Teacher's College, and The Institute of Musical Art. Emery Roth is the architect." A story in the New York Times, Tuesday, 4 July 1911, pg. 1, recounts the dispute by ex-mayor Seth Low over the unauthorized use of his name. The account includes the following regarding the developers, the Sethlow Realty Company, "The officers ... are Louis Eisenberg, President, and Isadore Cohn, Treasurer. They organized the company under the laws of New York in March, 1910, and called it 'Sethlow,' 'because,' as President Eisenberg said yesterday, 'it looked right over Columbia University, which is so intimately associated with ex-Mayor Low.' They opened offices at 149 Broadway and started to build the apartment house. As soon as it was finished they began inserting quarter-page advertisements in the newspapers, describing its attractions." This ad for the Sethlow Kitchenette Apartments appeared in the New York Times, 21 May 1911, pg. 82.
http://www.wikicu.com/ identifies 509 W. 121st St. as "Bancroft Hall, designed by Emery Roth, was constructed by a private developer in 1910 who hoped to market the apartments to professors and wealthy students. The developer originally named the building 'Sethlow', in honor of former University President and ex-Mayor of New York City Seth Low, whose decision to move Columbia University to Morningside Heights was instrumental in the neighborhood's development. Low was less than pleased by the unauthorized appropriation of his name, and threatened to get an injunction against the developer unless he changed the name. The developer acquiesced and renamed the building 'Bancroft.' Teachers College acquired the building during the 1919-1920 fiscal year along with Janus Court, an apartment building on Morningside Drive." The Manhattan telephone directory listed Bancroft Apts. at 509 W. 121st St. from 1912 to 1929. Then this changed to Bancroft Hall Teachers College from 1931 to 1963. This ad for the Bancroft Apartments appeared in the New York Times, 22 August 1914, pg. 12. A sign posted in 2014 identified Teachers College, Columbia University as the owner at that time. The people at the AIA Guide to New York City, 5th edition, 2010, enjoyed Bancroft Hall, writing, "In the shadow of Teachers College is this ebullient eclectic warhorse of a façade: aggressive, bold, charming, mysterious. An altogether wonderful discovery, with verdigris copper-clad bay windows and a timber Italianate Tuscan roof." www.6tocelebrate has the following to offer, "This fanciful Vienna Secessionist style building features copper-clad bay windows and a timber Tuscan-style roof. Originally an apartment house, Teachers College purchased the building in 1919 to serve as a dormitory. Emery Roth is renowned for the iconic Central Park West apartment buildings The Beresford, The San Remo and The Eldorado." www.usgwarchives.net shows a nice "penny postcard" of the Bancroft entryway.